A night at the opera is a night well spent. As the din of sound and energy rushes from the stage, each member of the audience lends their ear to awe-inspiring sound. Perhaps for the gentleman in the front row, the pounding of the timpani drums are enticing to his senses but to the ladies in the back of the house the stringed instruments carry their melody and sound especially sweet. But cannot the gentleman in the front row, with proper ear training, learn to much better appreciate the violins and violas? In a year’s time, will he not wish to sit in the back of the house with the ladies and remark at how well the solo expresses the minor third of the chord progression? Cannot the ladies sit upfront with the gentlemen to experience the pounding percussion so that their pulse may pound in their ears and their hearts race and flutter with the poly-rhythms? Just as someone may learn to read, speak and appreciate another language, the same person may learn the intricacies of a symphonic orchestra. The same can be said for things of a more spiritual nature. The shelves at Bookmans are overflowing with the most popular titles in spirituality in Southern Arizona. 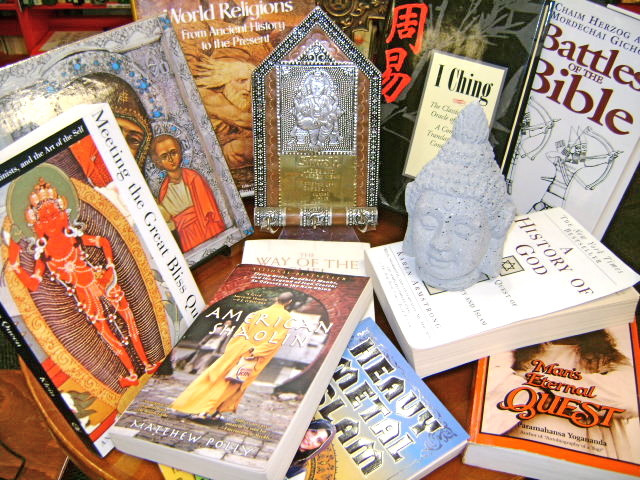 Our extensive Religion and Philosophy section is well accented with sub-genres, such as Christian Living, Christian Mysticism, Kabbalah, Comparative Religion, Disbelief, New Age, Secret Societies and more. Take some time for yourself among our shelves to do a little soul searching.